This article originally appeared in the St. Louis Beacon: Texas Gov. Rick Perry exhorted like-minded low-tax conservatives Thursday night to take action to persuade Missouri legislators to overturn Gov. Jay Nixon’s veto of the tax-cut bill that has consumed this summer’s political debate. “Make this happen! Grow Missouri! Override this veto!” shouted Perry, a Republican, as he sought to energize several hundred GOP activists who gathered in a giant air-conditioned tent set up outside the Doubletree Hotel in Chesterfield. Rick Perry wants Missouri employers to head to Texas. Perry’s 15-minute address largely mirrored the arguments he outlined in an interview Wednesday with the Beacon, in which he said that Missouri and other states could improve their economy by following Texas' lead. The state, he said, has turned around its fortunes by reducing taxes, cutting regulations and curbing lawsuits. But the Texas governor also asserted that failure to override Nixon’s veto could attract traffic of a different sort: “It’s going to be governors from all the country,’’ he said, flocking to Missouri to persuade its businesses to move to friendlier turf. Perry contended that other governors who have recently cut taxes -- such as Kansas Gov. Sam Brownback, a fellow Republican -- would be watching closely to see Missouri Republicans succeed or fail in overriding Nixon. “It’s truly a fight worth fighting,’’ Perry said. Earlier in the day, Nixon delivered that same message, but from a different point of view, as he told educators and parents that massive cuts to public education and other state services would be required if his veto of HB253 is struck down. Nixon also faulted Perry for advocating “this path of seeing who can most quickly win a race to the bottom,’’ which Nixon said wasn’t helpful for businesses or workers. Perry told the crowd not to be swayed by “the horror stories’’ of government programs that had to be cut, saying that was the same message that his critics delivered back in 2003, when Perry cut taxes and the budget to deal with a projected $10 billion shortfall. He said that the economic activity since then has refilled Texas’ coffers. Nixon, meanwhile, dismissed any comparison to Gov. Brownback in Kansas, by citing tax increases that Kansas lawmakers have had to impose since making dramatic cuts in their income tax rates for businesses and individuals two years ago. Nixon also repeatedly has highlighted the two tax hikes in HB253 -- the elimination of the sales tax exemptions on prescription drugs and textbooks, which the bill's backers say were mistakes that can be fixed next session. The substance of the Perry/Nixon back and forth, however, centers on the different tax structures in Missouri and Texas. Texas has no income tax, but Missouri has lower property taxes, sales taxes and fuel taxes. The National Center for Policy Analysis, a Dallas-based think tank that advocates free markets, said Thursday that both governors can claim bragging rights. According to the center’s calculations, “below-average income Missouri residents probably won’t lower their tax burden by moving to Texas” because of the latter’s higher property and sales taxes. Higher income people, the center said, would likely fare better in Texas because the lack of an income tax would more than make up for the other higher taxes. 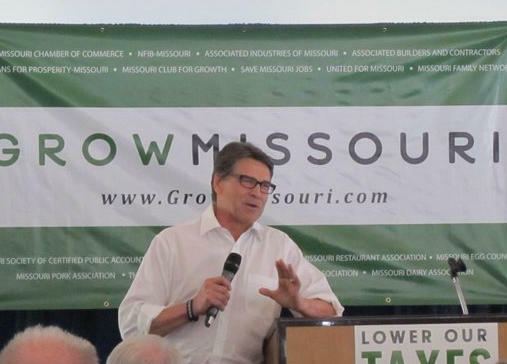 Perry was in Missouri, in part, to also appeal to St. Louis businesses to consider moving to Texas. Many area executives were invited to a private luncheon hosted by the Missouri Chamber of Commerce before the Chesterfield rally. Perry's trip was paid for by TexasOne, a pro-business group that also produced the pro-Texas radio and TV spots that have been running in St. Louis in a build up to his visit. Joining Perry at the podium in Chesterfield was Missouri House Speaker Tim Jones, R-Eureka, who repeatedly ripped into Nixon, a Democrat, for his “taxpayer-funded trips around the state’’ in opposition to HB253. “I have heard no plan and no vision’’ for an alternative, Jones declared, contending that he’s tired of “lofty speeches full of glowing rhetoric’’ by Nixon, who the speaker said has increasingly embraced “liberal, left-wing’’ policies. “Gov. Nixon believes he can spend your money more wisely than you can,’’ Jones said, igniting supportive “boos’’ from the audience. The fate of any veto override, especially of HB253, will be decided in the state House, where there are 109 Republicans – the exact number needed for an override. But only 100 Republicans voted for the bill’s passage the first time around. No Democrats are expected to support an override of Nixon’s veto. Several Republicans already have announced they plan to sustain the governor’s veto, in part because of rural educators’ fears that HB253 would force severe cuts in their state aid. Jones also got bad news earlier Thursday when Missouri Attorney General Chris Koster issued a legal opinion Jones had requested. Jones had wanted an opinion about Nixon’s contention that the state budget could be hammered even more because of a provision in HB253 that requires more cuts if Congress passes a law allowing states to impose sales taxes on internet sales. Koster, who has been silent on HB253, declared that Nixon was right – and that the bill’s provision also could allow taxpayers to claim additional refunds going back three years. Nixon, the state's previous attorney general, has estimated the refunds could cost the state $1.2 billion in a one-year hit, forcing massive additional cuts. Jones didn’t mention that opinion but blasted Koster at the Chesterfield rally, noting that Koster already is a declared Democratic candidate for governor in 2016. “He should not be our next governor!” Jones shouted. The Chesterfield rally was sponsored by Grow Missouri, a group funded by wealthy financier Rex Sinquefield and created primarily to challenge Nixon’s veto. Grow Missouri is planning to operate a caravan of buses to transport override supporters when the General Assembly’s veto session begins Sept. 11. The buses will originate from St. Louis County, St. Charles, Cape Girardeau, Independence, Columbia and Springfield.